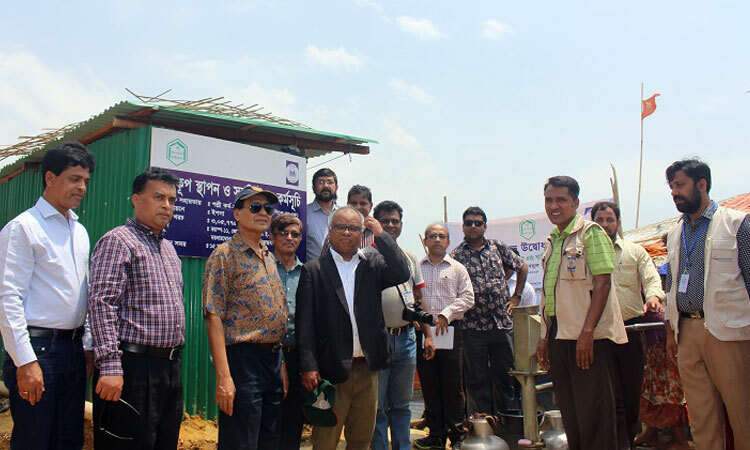 YPSA, an organization for sustainable development, has been praising the administration and the community by implementing various social development programs in greater Chittagong since 1985. YPSA has been implementing various development programs in different Upazilas of Cox’s Bazar district since 2008. 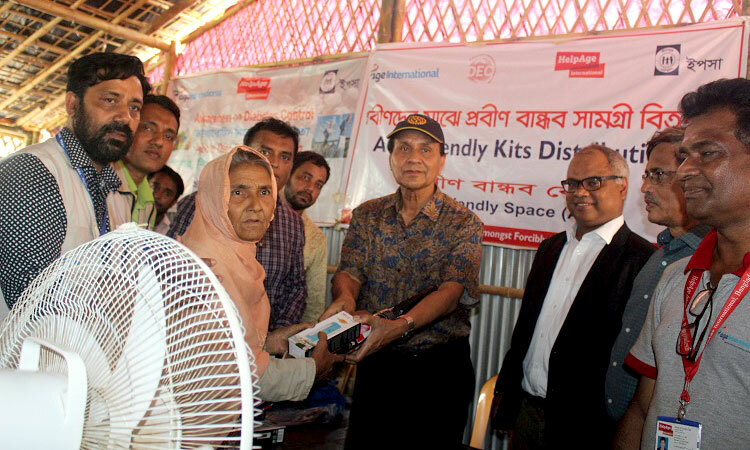 The government, the UN and other International development organizations, have been implementing various development programs in Rohingya camp for the forcibly displaced Myanmar citizens since September 2017, with the coordination and cooperation of the Office of Refugee Relief and Rehabilitation Commissioner, Cox’s Bazar and the District Administration Office, Cox’s Bazar, with the approval of NGO Affairs Bureau under Prime Minister’s Office. 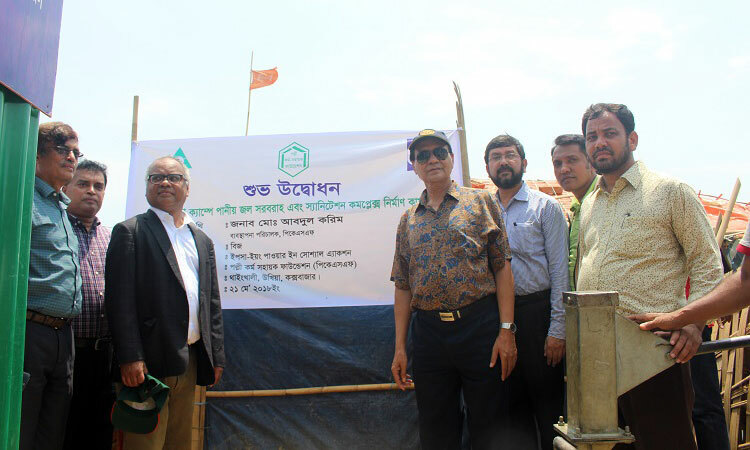 In continuation of this, YPSA with the assistance of Palli Karma-Sahayak Foundation (PKSF) has finished construction of drinking water supply and sanitation complexes in Rohingya camp. Mr. Md. Abdul Karim, Managing Director, PKSF inaugurated the complex on 21 May, 2018. Mr. Kamal Ahmad, President, Asian University for Women; Mr. Dipen Kumar Saha, Assistant General Manager, PKSF; Jahirul Alam, Executive Director, IDF; Md. Arifur Rahman, Chief Executive, YPSA; Palash Chowdhury, Director (Finance) and Focal Person of Disaster Management Unit Mr. Manjur Murshed Chowdhury, Director (Economic Development) and other senior officials of YPSA were present. The team visited the center of “General Food Distribution Program” at Balukhali 2/2 of the Rohingya camp conducted by YPSA with the assistance of World Food Program and Save the Children International. At that time, Md. Abdul Karim discussed various issues related to the program implementation with the staff of the center. The team also visited Age Friendly Space under the program “Response to the needs of Older People in Forcibly Displaced Citizens of Myanmar” implemented by YPSA and supported by Help Age International Bangladesh, for the forcibly displaced citizens of Myanmar, especially the elderly. 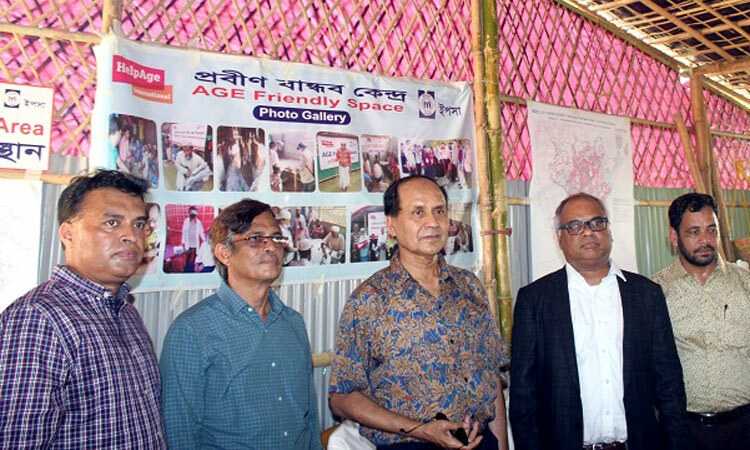 AGE Friendly Space located at the camp 11, 12 and 18 of Palangkhali Union under Ukhia Ppazila under Cox’s Bazar in Bangladesh.